All registered voters can vote whether they voted in the Special Election or not�� Voters can attend a Forum or Debate with the two candidates sponsored by the Oconee County Chamber of Commerce Thursday, June 30th at the Oconee Civic Center Theatre beginning at 6:30 p.m. .
We have a House District 113 Runoff on July 19, 2011, between a Democrat and a Republican. All registered voters can vote whether they voted in the Special Election or not. See results of June 21, 2011. Note how Democrats in Clarke County helped Dan Matthews make the runoff. Partisanship aside, I think Chuck Williams, Republican, is the most qualified and grounded in Oconee County. He is a native and well known in the County.He has worked closely with local governments. 1. Republicans control both houses of the General Assembly, Governor and all State Offices. A freshman Democrat would have minimal influence. 2. We are neck deep into reapportionment and need a strong voice at the Capitol. We do not want Oconee to be diced and spliced to allow neighboring officials safe havens. Oconee does not need to be divided to be part of Doug McKillip’s District. (If that happens, Oconee should vote for his Republican Opponent). 3. A Democrat will only last until the next General Election in 2012 and the District needs someone who can build some seniority. 4. Republican Williams is known by state officials and is particularly close to Ag Commissioner Gary Black and that can benefit Oconee County. 5. While the District Representative must represent the entire district, his largest constituency is Oconee County which is predominantly Republican. Oconee needs a Representative that will work for its interests and not a partisan agenda for State and National issues. Voters can attend a Forum or Debate with the two candidates sponsored by the Oconee County Chamber of Commerce Thursday, June 30th at the Oconee Civic Center Theatre beginning at 6:30 p.m.Then join me and others in voting for Chuck Williams for State Representative. NOTICE OF RUNOFF ELECTION: A Special Runoff Election will be held Tuesday, July 19, 2011 to fill the Congressional District 113 House of Representatives Seat. EARLY VOTING INFORMATION FOR RUNOFF ELECTION: Early voting will begin Monday, July 5, 2011 and end on Friday, July 15, 2011. Voters can vote in the Board of Elections office ONLY. The satellite site at the Civic Center is not open for early voting during a Special Election. Voters may also vote at the polls on Election Day, July 19, 2011 or they may request a ballot be mailed to them by calling the Board of Elections Office at 706-769-3958. 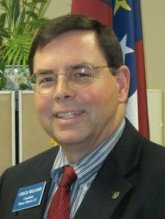 Chuck Williams is a native of Oconee County and as a young man (ca 1980) served a term on the Watkinsville City Council while I was City Attorney. Chuck is friendly, capable and likable. Chuck has been active in Forestry & Agriculture for several years. He is a friend and big supporter of Gary Black, State Ag Commissioner. Chuck Williams has been active with the Chamber, Development Authority and “plugged in” to the Oconee Establishment, especially in the last 11 years since the opening of North GA Bank. Dan Matthews is a Democrat and an unabashed Liberal. Dan has not been forthcoming about taxes and paying for the things he supports. Dan has crusaded for Obama and against Governor Deal, Congressman Broun and other Republicans. Dan is too liberal for me and, in my opinion, does not have the experience or background to be a State Representative for Oconee County. Democrat to ailing GOP Congressman Norwood- Resign or be victim of "Dr. Kevorkian style euthanasia"